2016 Canada (RCM) Gold MapleGram8? - 8 x 1 gram. 9999 Fine Gold Maple Leaf Coins. Provides both financial and cultural value to your portfolio. This pack includes eight individual Gold Maples, each made of one gram of. 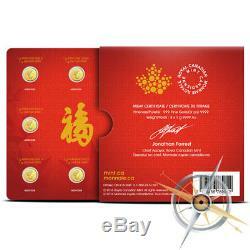 These coins are sealed in an assay card, and the assay card ships in a decorative sleeve. The obverse of each Gold Maple features a portrait of Queen Elizabeth II, designed by Canadian artist Susanna Blunt. &###x201C;ELIZABETH II&###x201D; is inscribed, along with &###x201C;2016&###x201D; and the denomination of 50 cents. Canada&###x2019;s iconic maple leaf can be found on the reverse. Inscriptions include &###x201C;CANADA, &###x201D; &###x201C;FINE GOLD 1g OR PUR, &###x201D; and &###x201C;9999. &###x201D; This product is designed to celebrate the Chinese community in Canada. 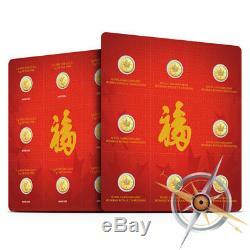 The packaging comes in red and gold, which represent dignity, good fortune, joy, and success. The lucky number 8 represents wealth and prosperity in Chinese culture. On top of these cultural nods, the Maplegram8 features many of the traits the have made the Royal Canadian Mint such a notable establishment. The coins are machined with precise radial lines for security, along with being given a distinct serial number. The authenticity and purity of these gold coins is guaranteed by the mint&###x2019;s chief assayer on the sleeve&###x2019;s assay certificate. At Provident, our primary goal is to make it simple and safe to invest in precious metals. We sell only genuine bullion products sourced directly from the mints that produce them, such as the US Mint, Royal Canadian Mint, Perth Mint, and more. In addition, our inventory holds a unique mix of products that you can only find at Provident. Additionally, our team is committed to offering exceptional customer service at every step of the investing process. You can rest easy knowing that you will get exactly what you ordered each and every time. All packages are fully insured during transit. Will I receive the exact item pictured? 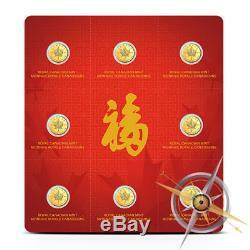 All photos are stock and are meant to represent the type and quality of item you will receive. Spot price is the market value of precious metals at a given point in time. Nearly all products in our store are priced at a premium or discount to the spot price. As spot price moves up and down throughout the day, so will the price of the product. How often are prices adjusted based on spot price? Similarly, our traders are NOT commissioned. What you see is what you get. Can I cancel my order? Cancellations are considered on a case-by-case basis. Is there a minimum order? There is no minimum order. Can I change my order once it has been placed? No changes can be made to the items included in an order once it has been placed, but a subsequent order can be placed. Yes, you can apply those monies at checkout. Will my order be insured? First off, we are sorry this happened. That said, it does happen, but we will make it right. We always do our best to do right by our customers. How long will my order take to get to me? This listing is currently undergoing maintenance, we apologise for any inconvenience caused. 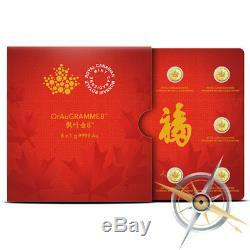 The item "2016 Canada (RCM) Gold MapleGram8 8 x 1 gram. 9999 Fine Gold Maple Leaf Coins" is in sale since Monday, May 14, 2018. This item is in the category "Coins & Paper Money\Bullion\Gold\Coins".